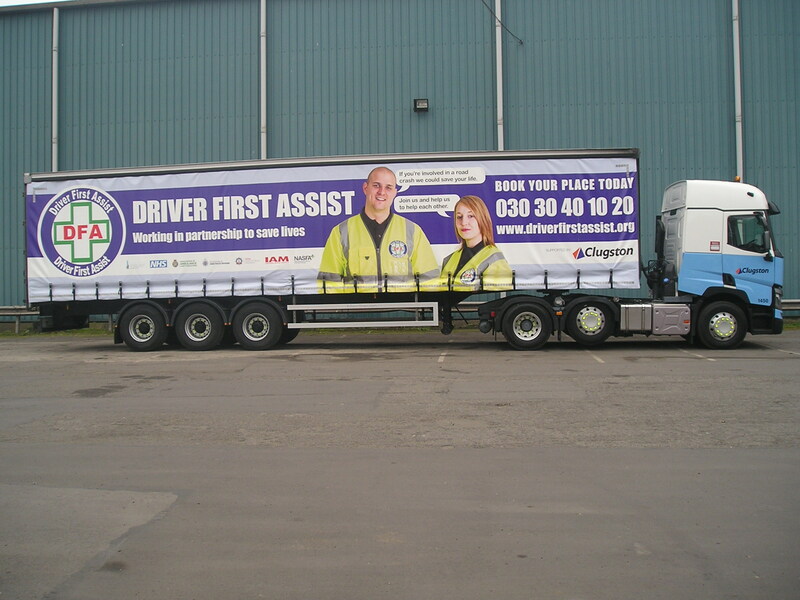 Leading Yorkshire/Lincolnshire transport company Clugston Distribution is showing its commitment to reducing the number of deaths and injuries on Britain’s roads by supporting the Driver First Assist (DFA) initiative. To further demonstrate their commitment Clugston have funded the cost of putting one of their curtain sided trailers into full DFA livery. The vehicle is now on the road promoting the scheme. The full size graphics will have a striking impact on motorways across the UK and hopefully give further impetus to the scheme’s growth. The first 17 volunteers from amongst the company’s 100+ drivers underwent DFA training at the beginning of the year led by professional trainers from the East Midlands Ambulance Service. All are now equipped with the knowledge and skills needed to quickly and accurately assess a road traffic accident scene. They are trained to provide a precise location and an accurate summary of the situation to the emergency services both ahead of their attendance at the scene and on arrival, taking steps to contain the incident by administering basic first aid, which could be life-saving. For each driver, the training qualifies as a module towards their Certificate of Professional Competence. Supporting the programme also integrates well with Clugston’s company-wide approach to health and safety with the company already certified to the international OHSAS 18001 standard. David Heath, head of logistics for Clugston Distribution, says: “We see Driver First Assist as a very worthwhile idea that resonates with us and our overall approach to health and safety. We advertised the opportunity to take part internally and got a good response enabling us to initially train 17 of our drivers. As the word spreads about the value of the training we are seeing further interest amongst our drivers, which is likely to lead to further training sessions. It is estimated that 46 per cent of fatalities could be prevented if first aid assistance was available early at the scene of a road traffic collision. Between 40 per cent and 85 per cent of these deaths may be due to airway obstruction. Death from a blocked airway occurs in about four minutes, while the target time for an ambulance to arrive on scene is around eight minutes. DFA is a not-for-profit organisation, supported by national business law firm and primary sponsor, DWF. All professional drivers, be they in a truck, van, bus, coach or car, can take part in the scheme, with a one-day training course costing just £95 and including a ‘first responder’ kit, followed by an annual £25 membership fee that includes a refresher course every three years. Speaking of the programme, DFA founder and former professional truck driver and transport union official David Higginbottom said: “Our vision is for hundreds – if not, ultimately, thousands – of trained drivers equipped to take action in the first critical moments after a road traffic collision. Along with a growing number of transport companies like Clugston Distribution joining the scheme, it is actively supported by all three of the main emergency services and has received the endorsement of Britain’s senior Traffic Commissioner.